Since having a baby 4 months ago, I have been trying very hard to eat healthy and lose the extra baby weight, Superbowl indulgences aside. I've made a lot of progress so far (28 lbs down! ), but, if I'm going to be honest, it's much, much harder than I anticipated. I've fluctuated with my weight over the years, so I'm no stranger to having to lose it, but the added stress and lack of time with having a new baby really makes it more challenging than it's ever been. When I do have a minute to eat something, if it's not already prepared and ready to go, or something that can be made without much effort or commitment - forget it. Suddenly the bread on the counter looks good enough, and the number on the scale stays the same. One thing that has helped is having healthy food in the house and lots of options for salads. They are easy to throw together, or make ahead of time, and lots of options mean I don't get bored. 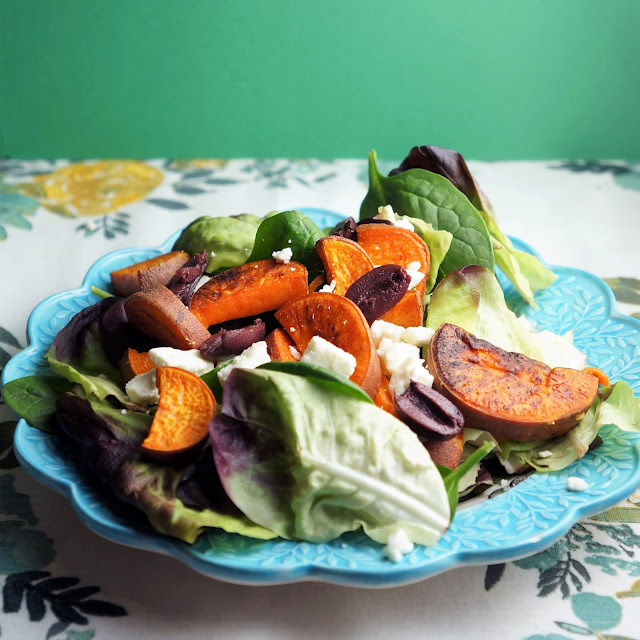 One of my faves right now is this yummy concoction of mixed greens, roasted yams, feta, and kalamata olives. I top it with my favorite vinaigrette, and that's all there is to it! 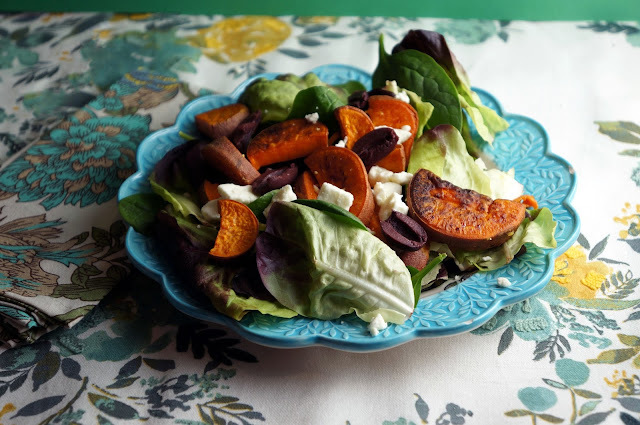 I'll tell you how I roast the yams to perfection, so you can make one of these yummy salads too. Whether you're trying to lose baby weight, eat healthier, or just like yams and salad, I know this will be a hit. Start by preheating your oven to 425 degrees F. Cut your yams into thin-ish, bite-sized pieces and toss into a dark roasting pan with olive oil and a generous pinch of coarse salt. Toss together to make sure everything is combined, and lay out as flat as possible. Feel free to use a piece of parchment paper - just check the temp it's suitable for. Roast for 20-25 min or until they are golden brown on the bottom. I don't bother flipping mine over at all. It doesn't bother me that they only brown on one side, and I kind of like them a little dark - I even cut a few really thin slices so I can have some crunchy yam chips when they're done. Feel free to flip them over halfway, through, if you wish. To put the salad together, just top your favorite greens with yams (warm or cold - these are great for leftovers! 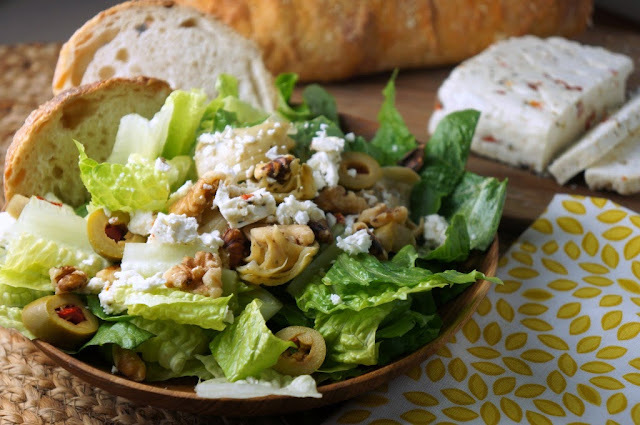 ), feta, olives, and your favorite vinaigrette. The best part about this is that it allows you to make the yams ahead and time and just toss this salad together whenever you feel like it. Such a time saver! Give it a try an let me know what you think. * This makes much more than you would need for salad. You can either refrigerate and use them for salads throughout the week, or you can eat the extra as a side dish.